The Maistic eco friendly kitchen sponge scrubber is completely microplastic and plastic free and produced without polyester or any other types of plastic or chemicals. Made using natural wood based cellulose fibres, the scourer top is natural loofah and is 100% vegan and compostable. Maistic eco friendly kitchen scrubber is a plastic free sponge with a natural loofah top for extra scrubbing power. This reusable eco friendly kitchen scrubber, is EU certified compostable and free of harmful chemicals, making them the ideal eco friendly kitchen sponge for the more heavy duty cleaning needs of your plastic free home. The EU compostable certification is one of the world’s most stringent environmental standard. This eco friendly kitchen scrubber will not crumble, and will endure a long and lasting life. Perhaps most importantly, when it does reach the end of its natural life it will compost beautifully and naturally. 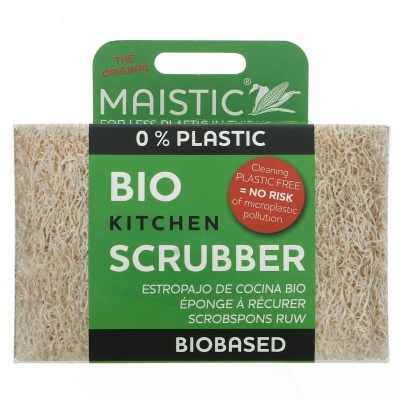 The scrubber part of the Maistic bio eco friendly kitchen sponge is made from the loofah plant. The cucumber-like loofah fruit is dried and smaller parts are sewn to the white cellulose sponge. Maistic are committed to offering viable, microplastic and plastic free everyday cleaning solutions and alternatives to the traditional plastic products widely available for the home. Material - Natural wood-fibre cellulose and loofah Microplastic free.